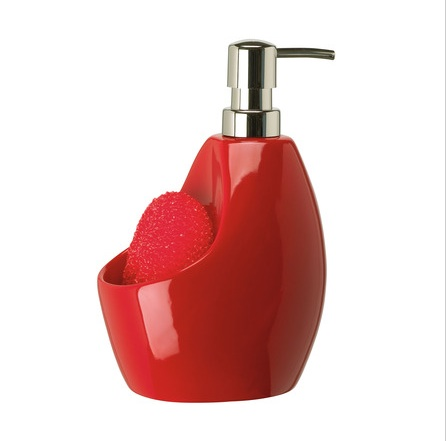 Made of high-gloss ceramic, this kitchen soap pump provides an array of convenient features. The unit not only dispenses soap from the soap pump, but it also provides a built-in scrubby holder, keeping both the soap and the scrubby together and easily accessible. It offers a 25-ounce capacity and works great in small kitchens, helping to reduce clutter that can form next to the sink like oversized bottles of dish soap and scrub brushes left lying around. One scrubby comes included. Designed by Sativa Turner, the soap pump measures 7-3/4 by 4-1/4 by 5 inches.